Chart of Isothermal Lines, shewing the mean annual Temperature of the different parts of the Earth's Surface. 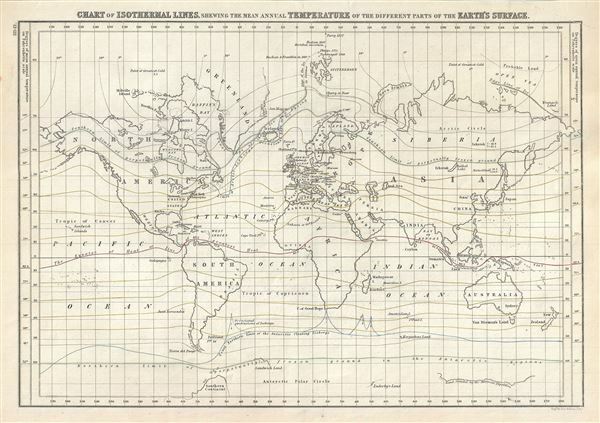 This is a fine example of Adam and Charles Black's 1844 map or chart of the World's isothermal lines showing the mean annual temperatures in the different parts of the Earth's surface. It covers the entire world with continents named while countries are unmarked. The Arctic regions include the voyages and discoveries of several explorers including Hudson in 1607, Phipps in 1773, Tschitsagoff in 1760, Buchan & Franklin in 1819 and Parry in 1827. The coast of Antarctica is drawn in sketchily, based upon early expeditions. Notes Canada's Boothia Felix (at the time believed to be the northern magnetic pole). The map is color coded with isothermal lines featured in green, yellow, red and blue. Various important cities, islands, oceans and other topographical details are marked. This map was engraved by George Aikman as plate no. III-II for issue in the 1844 edition of Black's General Atlas. Very good. Original platemark visible. Blank on verso. Damage and verso repair over top right corner. Rumsey 2305.007 (1854 edition). Philips (atlases) 4334.